The Public Health major prepares students to plan, implement, and evaluate public health programs for individuals, groups, and populations in a variety of settings that include worksites, hospitals, schools, and communities. As healthcare costs continue to rise in the United States, training a highly skilled public health workforce is becoming a much greater priority. Courses in this major introduce students to the five core public health competency areas (Behavioral Social Sciences, Biostatistics, Environmental Health, Epidemiology, and Health Policy and Management). An internship at a worksite or in a clinical, community, or government public health setting is part of the curriculum. The goal of the program is to prepare students for entry-level positions in a variety of public health areas. Some students choose to pursue graduate or professional education. Students with the goal of earning a Master of Public Health (MPH) degree now have the opportunity to pursue an accelerated 5-year program through the College of Health and Human Sciences; the accelerated option can potentially eliminate one year of tuition costs and allow an additional year in the workforce. In addition to entering the workforce and pursuing Public Health, students pursue graduate/professional school in other areas such as nursing, occupational therapy (OT), physical therapy (PT), physician assistant (PA) and medicine. Graduates of the undergraduate program are eligible to sit for the ACSM/NPAS Physical Activity in Public Health Specialist (PAPHS) Exam and the NCHEC Certified Health Education Specialist (CHES) Exam. I have a cousin who graduated from Purdue’s School of Electric Engineering. When I visited my cousin at Purdue, I fell in love with the campus. I was also fascinated by Purdue’s history. It was during that visit that I decided I wanted to be a Boilermaker! The faculty and staff I have encountered are experienced, caring and helpful. They also are a good source of information, inspiration and advice. My advice is to not be afraid to ask for help because this is how you learn. Do not isolate yourself. 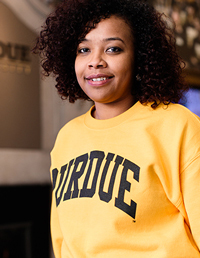 Get involved with the Purdue community. Take advantage of resources available to you both on and off campus. Use the Online Writing Lab (OWL), the libraries, the Center of Career Opportunities (CCO). Go to Purdue basketball and football games, attend Purdue convocations, and have fun! To be a successful student, you need to learn how to manage your time and how to multitask. You need to learn how to balance different activities like socializing, exercising, going to movies, but also stay focused on your academics. We all go through hard times as students. We might feel stress from a class load, exams, or feeling homesick. When this happens, do not hesitate to talk about it with your friends or with a counselor at CAPS (Counseling and Physiological Services) at Purdue. My favorite thing about Purdue is the simplicity and convenience of campus. The way the campus is set up makes it easy to get around. It feels like a home away from home. Also, I like the challenging curriculum which motivates you as well as stimulates your brain and prepares you for the real world. I did an internship related to my Public Health major. I had the opportunity to work in the Hypertension Program offered by the A.H. Ismail Center for Health, Exercise and Nutrition. This program includes faculty and students majoring in different disciplines (Pharmacy, Nutrition, Applied Exercise and Health, and Public Health). The students work together to help Ismail Center clients with hypertension learn how to live a healthy lifestyle by maintaining their blood pressure through diet and exercise. The Hypertension Program exposed me to the clinical part of my major; the internship experience overall advanced my interpersonal communication skills, time-management skills, and professional skills. I also participated in Purdue’s Louis Stokes Alliance for Minority Participation program known as LSAMP. This is a research program that provides undergraduate students the opportunity to explore research areas and exposes them to a variety of career paths. Through LSAMP, I was able to be a research assistance for three semesters. My area of research was breast cancer, and my research project involved working on different chemotherapeutic drugs to measure their cytotoxicity on breast cancer. Also: Completion of college-level biology or chemistry course with a grade of C or higher.